All aboard! 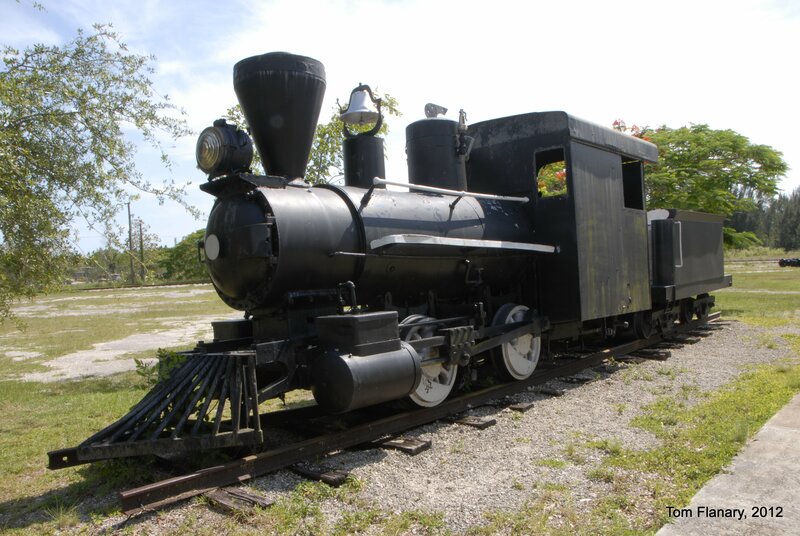 Climb aboard the Ellerbe Creek Railway for an old-time train ride through the Museum grounds. 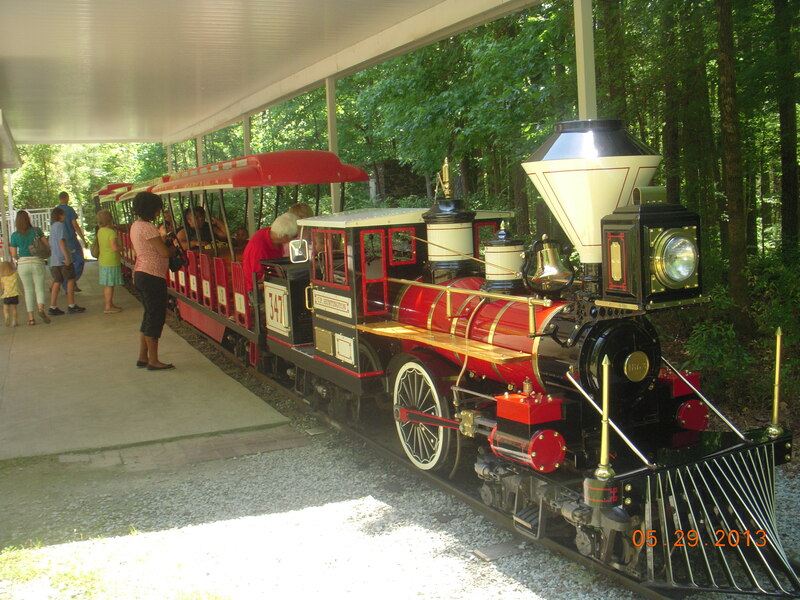 The 10-minute train ride makes two laps through our Nature Park on the beloved scaled replica C. P. Huntington locomotive, made possible by a generous donation from the Teer family. The train runs daily (weather permitting) beginning at 10:30 a.m. every 30 minutes in the morning, and every hour in the afternoon until 4 p.m.
Tickets are available on a first-come, first-serve basis daily. Rides cost $3.00 per person. Children under 3 years of age ride free on an adult’s lap. Refunds are provided for cancelled runs only. Caroleers are a vibrant acapella group based at Mt. Zion Wesleyan Church in Thomasville. Authentic costumes dating from the 1880’s allow listeners to be transported back in time as they listen to familiar carols like Silent Night, children’s songs like Rudolph, and seasonal favorites like White Christmas. Since 1994, the group has logged over thirty performances at Biltmore House in Asheville, sung at Chinqua Penn Plantation in Reidsville and has performed for numerous functions from banquets to nursing homes. We have added 2 new passenger cars, therefore, we can ride an additional 100 people per train ride. We are putting a new exhibit in the service station with antique toys and Coke memorabilia. We are planning on having a horse drawn wagon ride to the Reid Plantation and having the blacksmith, slave kitchen and main house open. Every 30 minutes the train will leave the station with the last train leaving at 8:00 pm. If demand is high then we will run the last train at 8:30. Excursion Travelers Can Enjoy Civil War History and a Great Harvest Festival with Trips Planned to Appomattox, Va. and Toccoa, Ga.
SPENCER – An extremely popular offering from the N.C.TransportationMuseum and the Watauga Valley Railroad Historical Society & Museum is just a few months from rolling down the tracks. This year’s Autumn Train Excursions will travel to Appomattox, Va. Saturday, Nov. 3 and Toccoa, Ga. Sunday, Nov. 4. These excursions provide the rare opportunity to take a daylight train trip on vintage rail cars through beautiful countryside during the autumn leaf-peeping season. 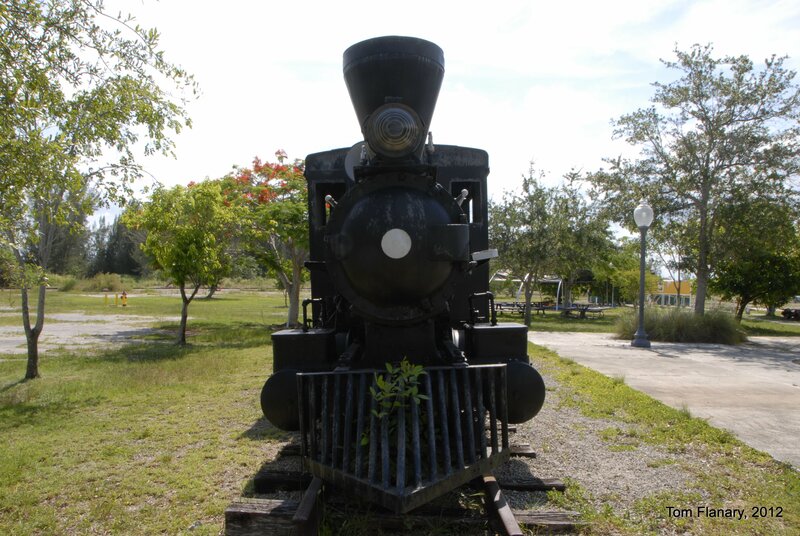 Passengers can enjoy the romance of riding the rails and with great destinations. Tickets for the museum’s Autumn Train Excursions typically sell out and some options are already unavailable. Those wishing to purchase are urged to act quickly. 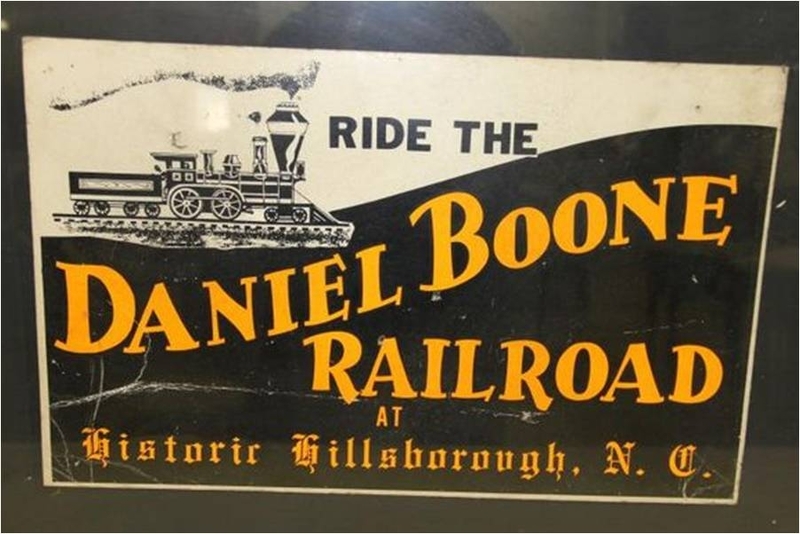 These one-day trips are presented by the N.C. Transportation Museum Foundation and the Watauga Valley Chapter of the National Railway Historical Society and act as fundraisers for both organizations. The Virginia Autumn Special will depart from Spencer, N.C., with additional passenger pick-up at the Greensboro Amtrak Station. The train will travel through the northern portion of the North Carolina Piedmont before crossing into central Virginia. Passengers will be treated to spectacular views as the train crests the WhiteOakMountain and crosses the Dan and RoanokeRivers on its way to Lynchburg, where it will turn east toward Appomattox. Passengers will disembark at the restored Appomattox Station, once a stop for the South Side Railroad in the late 1800s and now home to the AppomattoxVisitorInformationCenter. This charming small town holds claim to one of the most significant moments in U.S. history—the surrender of General Robert E. Lee to end the Civil War and reunited a divided nation. Virginia Autumn Special passengers can enjoy the historic shops and restaurants of Appomattox’s quaint downtown, or, for a nominal additional fee, explore either the AppomattoxCourtHouseNationalHistoricalPark, or the Museum of the Confederacy’s newly-opened Appomattox site. Shuttle buses will provide transportation to both sites. We strongly recommend that passengers planning to visit either of these sites pack a lunch, pre-purchase a box lunch, or plan to purchase lunch on the café car, due to time limitations at the destination. 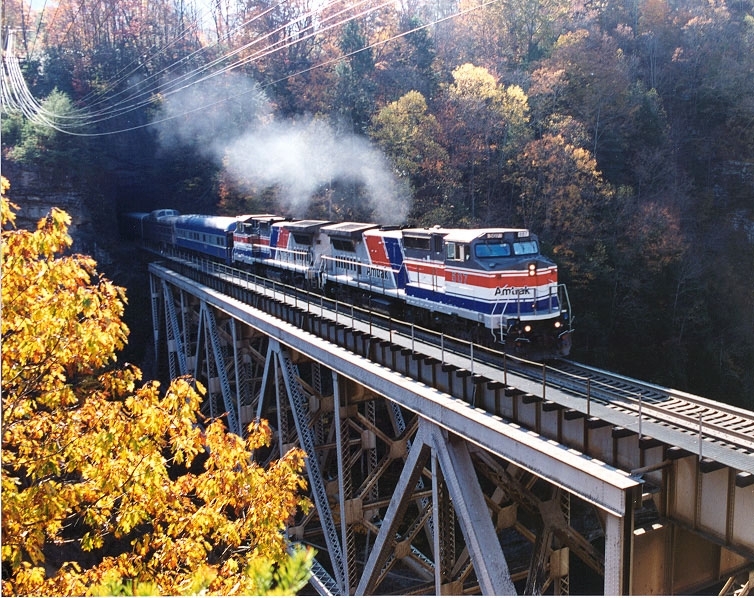 The Georgia Autumn Special will depart from Spencer, N.C., with additional passenger pick up at the Spartanburg Amtrak Station before traversing what was once Southern Railway’s main line, running from Washington, D.C. to Atlanta, Ga. Passengers will enjoy the gala fall colors of Carolinas’ rolling foothills, before crossing the 100-foot Seneca River trestle spanning Lake Hartwell to arrive at Toccoa. Nestled into the foothills of the Southern Appalachian Mountains, the historic town will be bustling with activity during the 30th annual Harvest Festival. Passengers will have approximately three hours to enjoy the festival, which features handmade, handcrafted and home-grown items from more than 200 vendors, as well as delicious regional foods, great entertainment on two stages, children and youth activities, buggy rides and much more. ToccoaFalls, named for the Cherokee word “Toccoah” meaning beautiful, is a must see. Located on the campus of ToccoaCollege, the 186-foot falls are 26 feet taller than Niagara Falls. Shuttle buses will be making a continuous loop between downtown Toccoa and ToccoaFalls. Several seating options and pricing are available for excursion passengers. Prices are the same for each destination. Tourist Class features the convenience and comforts of modern Amtrak cars. Each car has a center aisle with two adjustable seats and a wide window on each side. This seating area provides convenient access to the Souvenir and Cafe cars. Tourist class seating is $150 per person. Deluxe Coach Class passenger cars feature spacious seating with adjustable seat backs and leg rests, as well as large windows for better viewing. Lunch will be served in vintage lounge and dining cars. Light snacks and beverages are also provided. Deluxe Coach Class seating is $185 per person. This option is already sold out for our Appomattox trip. Premium First Class passengers will be seated in restored, vintage lounge or parlor cars. Each car is configured differently with a variety of seating options. Compartment seating is also available for small groups (only available with phone orders. Fare includes continental breakfast, newspapers, light snacks and dinner. Premium first Class seating is $260 per person Compartment seating is also available for groups of two, three or four at a reduced price. Compartment seating is only available with phone orders. across the walls and ceiling on the second level, providing a panoramic view of the entire ride. Tickets include a continental breakfast and newspapers on the journey plus dinner on the return trip served in vintage lounge and dining cars. Dome tickets are $295 per person. This option is already sold out for our Appomattox trip. Passengers that do not have lunch included in their ticket package have the option of a gourmet box lunch. Delivered to your seat, passengers can save time for shopping and sightseeing. Served in a souvenir tote, the meal includes chicken salad on a croissant, pasta salad, fresh fruit, homemade pound cake and a drink. Box lunches, available for $15 per person, should be ordered in advance with your ticket purchase. Those taking advantage of Saturday’s visit to the Appomattox Court House and Museum of the Confederacy are strongly encouraged to take advantage of this option. Tickets can be purchased by calling Sara Gettys at 704-636-2889 ext. 237 or visiting online at www.nctrans.org. The North Carolina Transportation Museum Foundation and the Watauga Valley Railroad Historical Society & Museum are non-profit organizations.